A 65-year-old male presented with a blue-tinted, palpable mass located lateral to the midline of his left chest. No trauma, rash, or pain was associated with the region. He denied personal or family history of breast cancer. However, the patient had a remote history of squamous cell carcinoma, which was surgically removed several inches from his site of palpable concern. He also underwent radical prostatectomy for prostate cancer. No radiation treatment was used for the described cancers. Imaging studies were obtained and subsequent biopsy revealed primary angiosarcoma. Mammography of the left breast demonstrated a 1.5 × 0.8 cm uncalcified, oval mass at the 9-10 o’clock position, which corresponded to the site of palpable abnormality (Figure 1A). Ultrasound revealed a correlating 1.3 × 0.5 × 0.8 cm isoechoic mass that was subsequently biopsied (Figure 1B). Staging computed tomography (CT) with intravenous and oral contrast showed no evidence of metastatic disease. Diagnosing angiosarcoma is challenging due to the rarity of these tumors as well as their nonspecific and variable presentation across different imaging modalities. Mammographic findings for primary angiosarcoma include an ill-defined, noncalcified mass or focal asymmetry.2,4,5,6 Secondary angiosarcoma may demonstrate skin thickening, which is difficult to discriminate from expected post-irradiation skin changes.5 Sonographically, primary angiosarcomas may appear hyperechoic, hypoechoic, or heterogeneous with well-circumscribed to ill-defined margins. 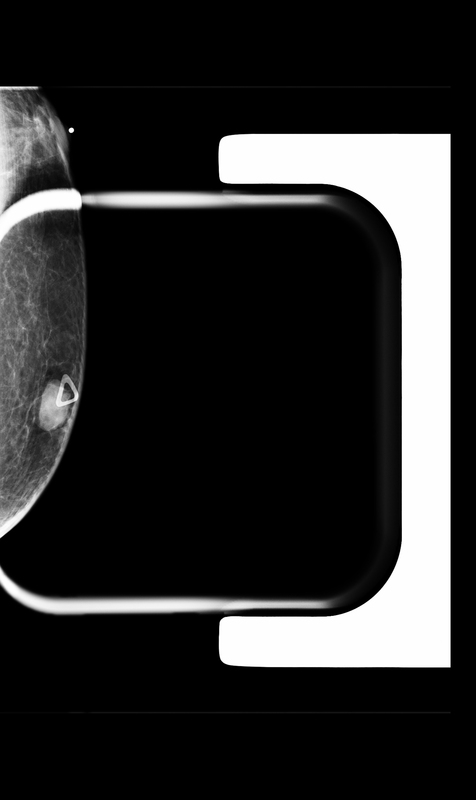 Hypervascularity on Doppler and disruption of normal breast architecture are also common. 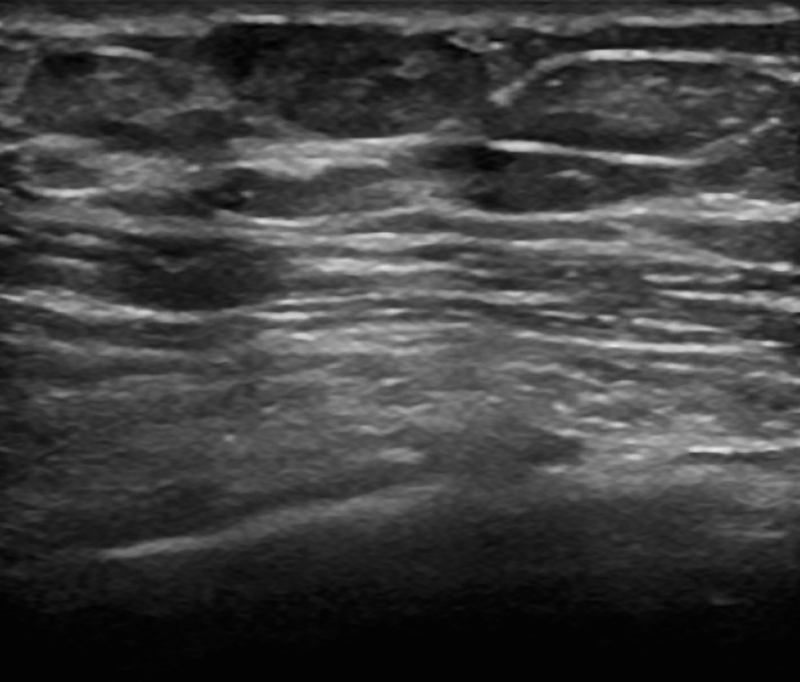 Skin thickening may be the only detectable abnormality for secondary angiosarcoma on ultrasound. Surgical resection with mastectomy, or to negative margins, is the mainstay of treatment for both primary and secondary forms of angiosarcoma.1,3 There are no clearly defined adjuvant chemotherapy or radiation regimens for mammary angiosarcoma. However, studies have shown that doxorubicin or paclitaxel treatments demonstrate some benefit.1,3 Hyperfractioned radiation in conjunction with chemotherapy may prevent recurrence in cases of secondary high-grade lesions.2,8 Axillary dissection is typically not indicated as metastatic nodal involvement is rare. Mammary angiosarcoma is a rare, aggressive neoplasm of vascular or endothelial origin. Most accounts of mammary angiosarcoma are in females. This case is unique as there are only a few other documented cases of primary angiosarcoma of the male breast in the literature. Diagnosis of angiosarcomas is difficult due to their nonspecific, variable presentation on clinical and imaging studies. Mammographic findings for primary angiosarcoma may include a solid, noncalcified mass, or focal asymmetry. On ultrasound, primary angiosarcoma may appear as a hypoechoic, hyperechoic, or heterogeneous mass. Secondary angiosarcoma may only present as skin thickening on mammogram and ultrasound. For a definitive diagnosis, tissue sampling and subsequent histological studies are required. Surgical excision is the mainstay of treatment for mammary angiosarcoma, but adjuvant chemotherapy and hyperfractioned radiation therapy may improve patient outcome particularly in high-grade cases. Arora TK, Terracina KP, Soong J, Idowu MO, Takabe K. Primary and secondary angiosarcoma of the breast. Gland Surg. 2014;3(1):28-34. Kamat L, Rosa M, Weinfurtner R, Drukteinis J, Falcon S, Patel B. Primary Breast Angiosarcoma in a Male. Breast J. 2015;21(5):545-548. Scow JS, Reynolds CA, Degnim AC, Petersen IA, Jakub JW, Boughey JC. Primary and secondary angiosarcoma of the breast: the Mayo Clinic experience. J Surg Oncol. 2010;101(5):401-407. 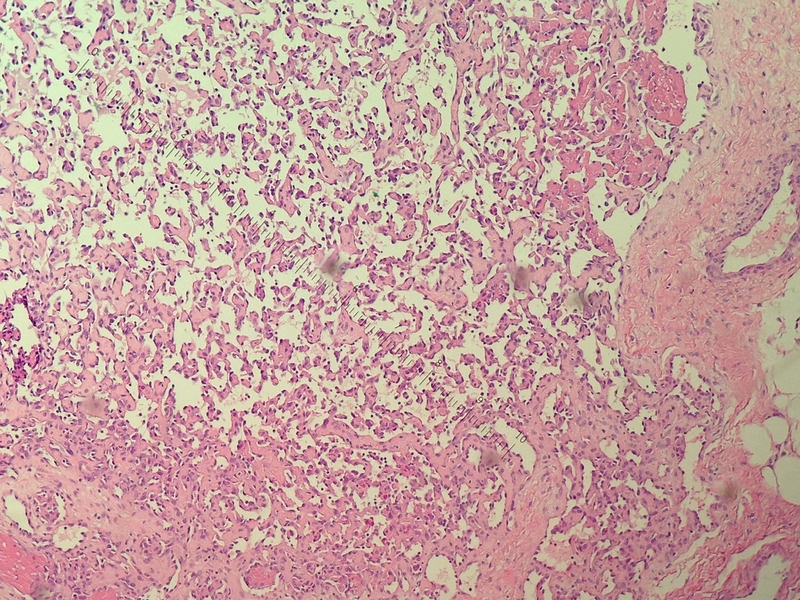 Glazebrook KN, Magut MJ, Reynolds C. Angiosarcoma of the breast. AJR Am J Roentgenol. 2008;190(2):533-538. Eppelheimer CN, Marti JL, Eisenberg A, et al. A Case of Secondary Angiosarcoma of the Breast after Breast-conserving Surgery and Radiation: Review of Radiologic and Pathologic Findings. J Clin Imaging Sci. 2015;5:45. Bhosale SJ, Kshirsagar AY, Patil MV, Wader JV, Nangare N, Patil PP. 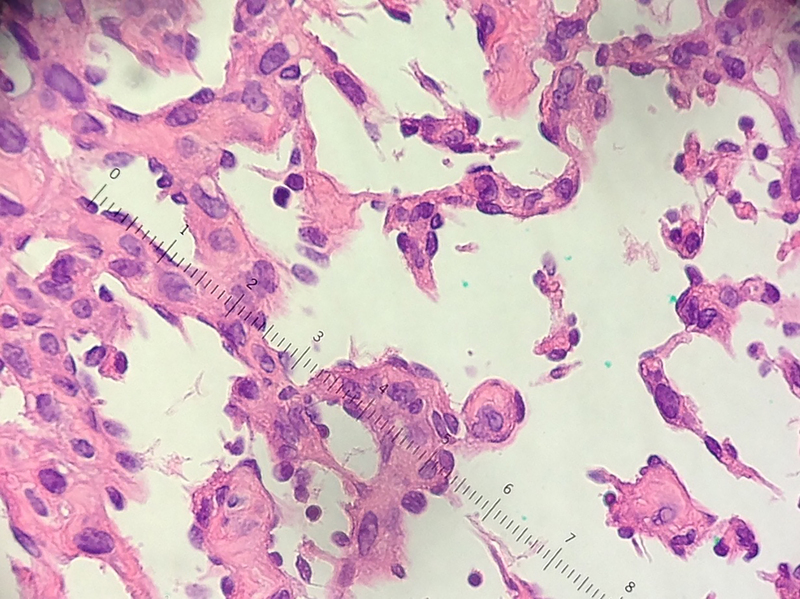 Primary angiosarcoma of breast: A case report. Int J Surg Case Rep. 2013;4(4):362-364. Nascimento AF, Raut CP, Fletcher CD. Primary angiosarcoma of the breast: clinicopathologic analysis of 49 cases, suggesting that grade is not prognostic. Am J Surg Pathol. 2008;32(12):1896-1904. Smith TL, Morris CG, Mendenhall NP. Angiosarcoma after breast-conserving therapy: long-term disease control and late effects with hyperfractionated accelerated re-irradiation (HART). Acta Oncol. 2014;53(2):235-241. Rosen PP, Kimmel M, Ernsberger D. Mammary angiosarcoma. The prognostic significance of tumor differentiation. Cancer. 1988;62(10):2145-2151. Holm M, Aggerholm-pedersen N, Mele M, Jørgensen P, Baerentzen S, Safwat A. Primary breast sarcoma: A retrospective study over 35 years from a single institution. Acta Oncol. 2016;55(5):584-590. Awan LB, Bhandarkar G, Kim J, Lin T. Primary mammary angiosarcoma in a male. Appl Radiol. 2017;46(10):33-35. Prepared by Dr. Awan while a Radiologist, Dr. Bhandarkar while a Pathologist, and Dr. Kim while a Diagnostic Radiology Resident at Beaumont Hospital – Dearborn Campus, Dearborn, MI; and Mr. Lin while a second-year medical student at Wayne State University, Detroit, MI.